Relying on documents obtained through a Freedom of Access request, journalist Mike Tipping says LePage held eight meetings with individuals connected to the sovereign citizens movement, a loosely affiliated group of individuals who challenge the authority of state and federal governments. The FBI says individuals connected with the movement have been responsible for the murder of six police officers since 2000. On Monday, LePage’s office confirmed that the governor had held meetings with individuals connected to the movement. 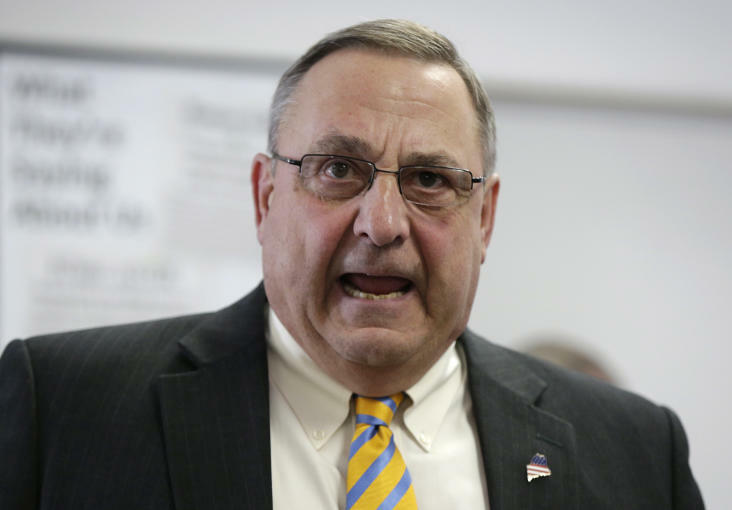 However, LePage’s press secretary told the Maine Public Broadcasting Network that criticism of the governor was politically motivated and timed to hurt his re-election efforts. "We're not even into the month of July and we're hearing this political rhetoric from Democrats, and clearly they have already jumped the shark," Adrienne Bennett told MPBN. Bennett added that LePage meets with “hundreds” of individuals, including Democrats and progressive leaders, to discuss public policy issues and that a meeting does not constitute an endorsement of issues raised. Individuals connected to the sovereign citizens movement also confirmed the meetings to MPBN, saying they spent a total of 16 hours discussing issues with LePage. "And we also discussed this there, that as far as I know, the penalty for high treason hasn't changed in a hundred years, and I didn't say it, but the governor said it — I never opened my mouth and said the word — the governor looked at us and looked at his buddy and said, 'They're talking about hanging them,'" McCarthy said during the broadcast. "I said, 'Praise the Lord — we'll hang a few and be done with this crap,'" McCarthy said when discussing how he allegedly followed up LePage’s comments. The Maine Constitutional Coalition also denied details of Tipping’s report and said any allegations of the group’s ties to domestic terrorism are false. Alfond, who is the state Senate president, said Maine State Police officials were notified of the alleged threat of violence made against him and Eves but that no public record of the remarks exists. Regardless of what was discussed, in his report, Tipping says LePage’s own staff unsuccessfully lobbied him against meeting with members of the Constitutional Coalition. "It's interesting looking through these Freedom of Access documents and seeing his staff trying to convince him not to meet with and believe these people," Tipping told MPBN. "I mean, it's just very strange, disappointing and a little scary all around." Follow Eric Pfeiffer on Twitter (@ericpfeiffer).